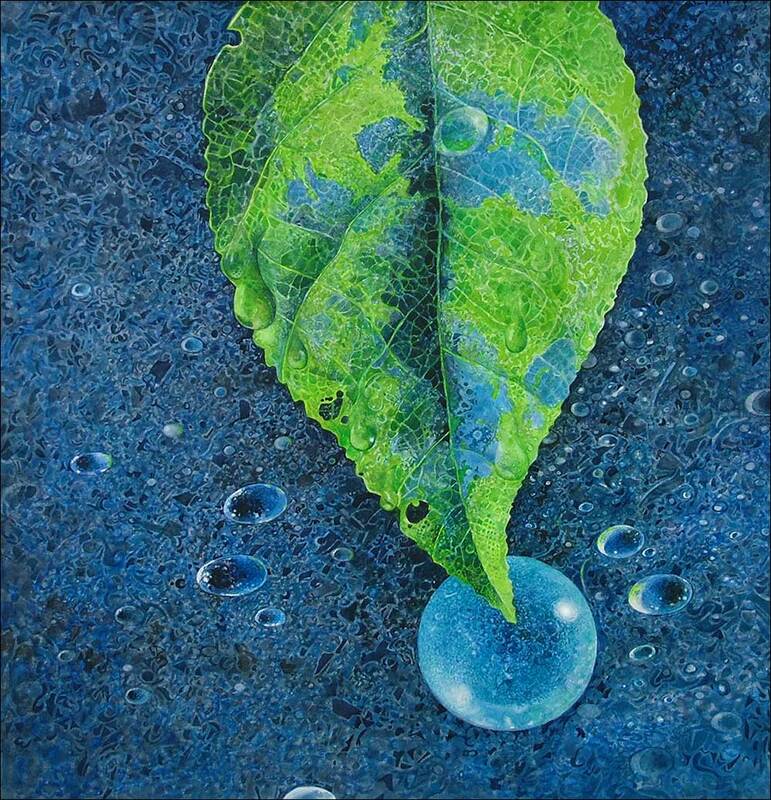 Widely recognized as one of America’s top contemporary artists, Greg Mort created the watercolor, Circle of Blue, in honor of Circle of Blue’s commitment to global water issues. Circle of Blue watercolor painting by Greg Mort. Limited edition, museum quality prints are available for purchase from the artist, gregmort@gregmort.com, with 100 percent of proceeds benefiting Circle of Blue’s ongoing coverage of global water issues. 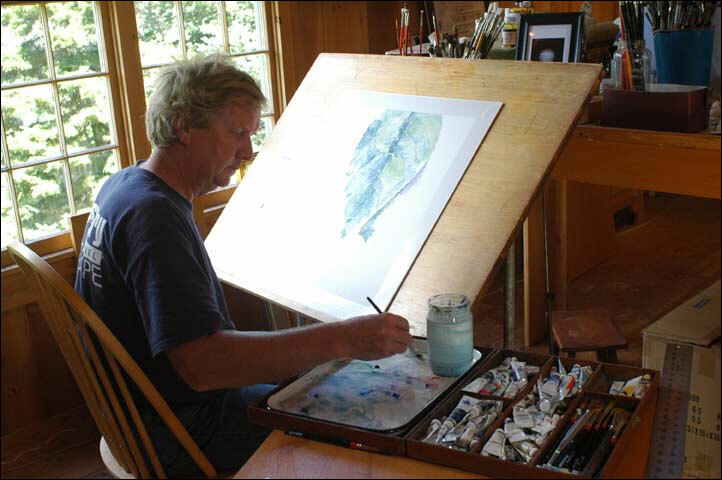 Greg Mort in his studio, creating Circle of Blue watercolor print. Greg Mort’s paintings reflect the wonders and beauty of the natural world. Mort says his family’s Art of Stewardship Project encourages stewardship of the earth and environmental awareness through the arts. The theme began with Stewardship I, a piece painted in 1991 at his Port Clyde, Maine studio that became part of President and Mrs. Bill Clinton’s collection during their early days in the White House. Mort had just read “Earth in the Balance” when he received the special commission to paint Stewardship II for then Vice President Al Gore. Mort created Stewardship III in 2004 to celebrate his twenty-fifth wedding anniversary and is now part of a private collection in Boston, Massachusetts. Stewardship IV was inspired in 2007 to mark Mort’s thirtieth year of painting in Maine and is part of the David H. Hickman Collection at the Academy Art Museum in Easton, Maryland. The Art of Stewardship Project was formally established in 2008, and, to mark this milestone, Mort painted Stewardship V which has been recently acquired by the David H. Hickman Collection. Mort says The Art of Stewardship is a grass-roots effort that organizes forums and opportunities for artists to explore environmental themes. Largely self-taught as an artist, Greg Mort is considered one of America’s foremost contemporary painters and a preeminent influence on art in the twenty-first century. His unmistakably modern creations have the classic feel of the Dutch Masters but are juxtaposed with startlingly modern designs. They are included in many prominent collections including the Smithsonian, Corcoran Gallery of Art, Delaware Art Museum, Academy Art Museum, Portland Museum of Art, and Brandywine River Museum. Mort’s fascination with space and the universe pervades his career and weaves itself through his paintings. For over twenty years, he has contributed to the space program, joining the ranks of American artistic icons Norman Rockwell and Robert Rauschenberg, who also recorded our nation’s historic venture into space. I had the pleasure of meeting Greg and his wife at their studio in Maine. They are gracious, talented and committed to stewardship of our planet. They are truly American treasures.